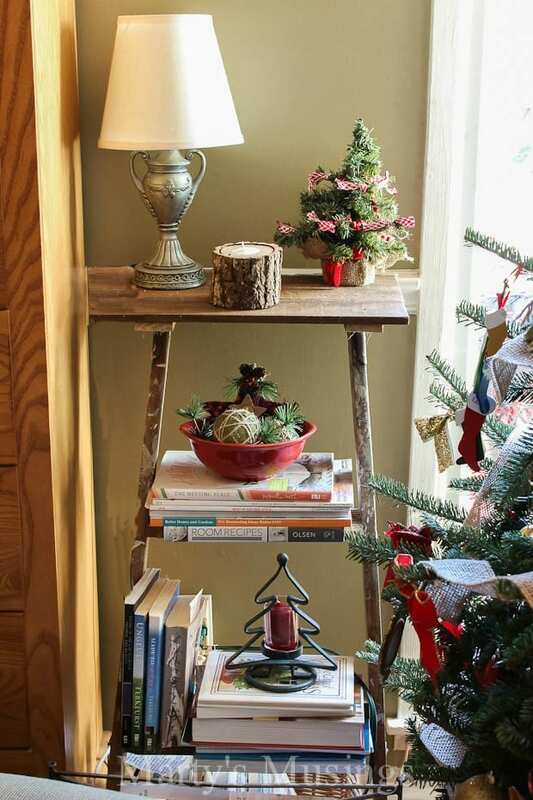 These 5 cheap Christmas decorations will help you create the simple, authentic home you’ve been longing for. 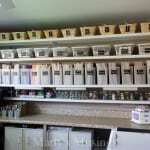 No more boxes of costly decor or wasted time! 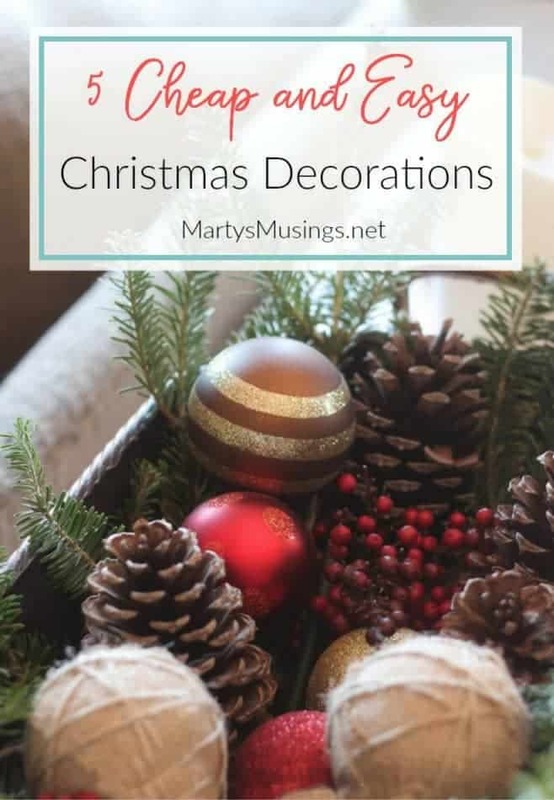 You have a few minutes to kill while waiting in the carpool line so you scroll Pinterest for a few Christmas decorating ideas. Beautiful flocked trees with handmade ornaments. Perfectly designed rooms with a color theme executed throughout the home. After all, it’s the most wonderful time of the year and you MUST keep up with Pinterest perfection. Pretty soon you’re discouraged and ready to give up on the idea of a REAL Christmas home, filled with the things you cherish and people you love. Why does Christmas have to feel so stressful and require so much stuff? This year my DIY hubby and I are on the precipice of our biggest DIY project ever. As in EVER. Our kitchen remodel has taken over our lives. The planning has been going on for weeks and weeks. We now have a hole in our kitchen floor where we discovered rotted wood, two less cabinets on the wall and 1/4 of the contents packed away in tubs. And our deconstruction date isn’t until January 2nd! Let’s just say I wasn’t invited on any blogger tours this year and I’m okay with that. Actually, I’m on a mission to discover my own personal style while living with less STUFF, and what I’ve learned from you, my readers, is that you want help with that same problem. 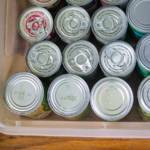 You want to spend less money, declutter and have stress free decorating. You want to concentrate on the things that matter most: family, friends and cherishing the moment. 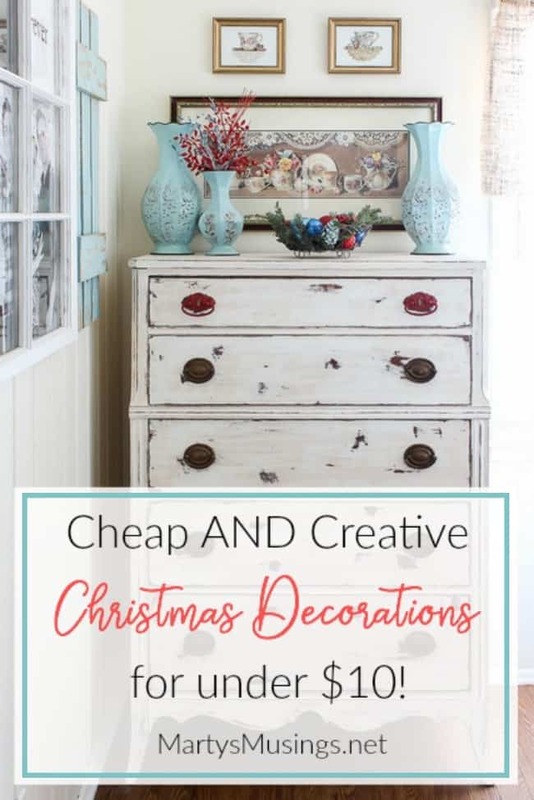 I believe it is so here are the 5 cheap Christmas decorations I use to create a simple, authentic home. Ornaments are one of the most cheap Christmas decorations you can buy. I find them everywhere from the dollar store, at end of season clearance sales to yard sales. Ornaments are also for more than decorating the tree. 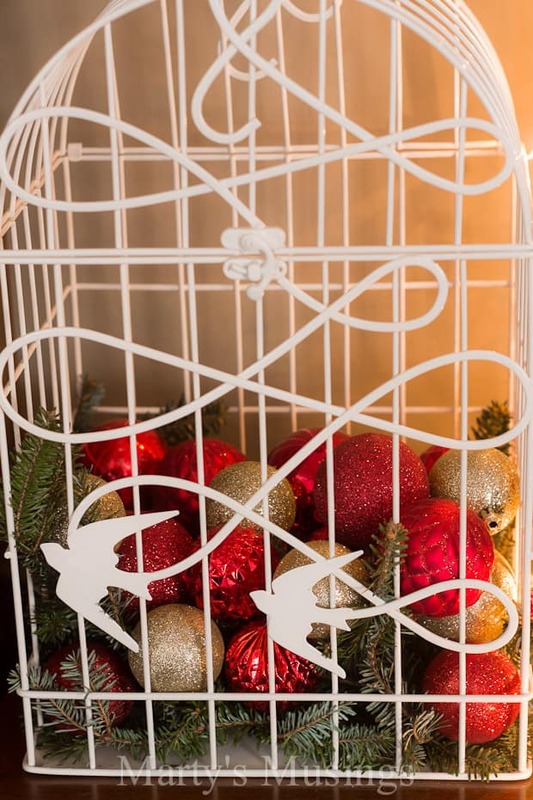 Collect them in containers, add them to a bit of greenery and berries or even layer them in a bird cage like I did! 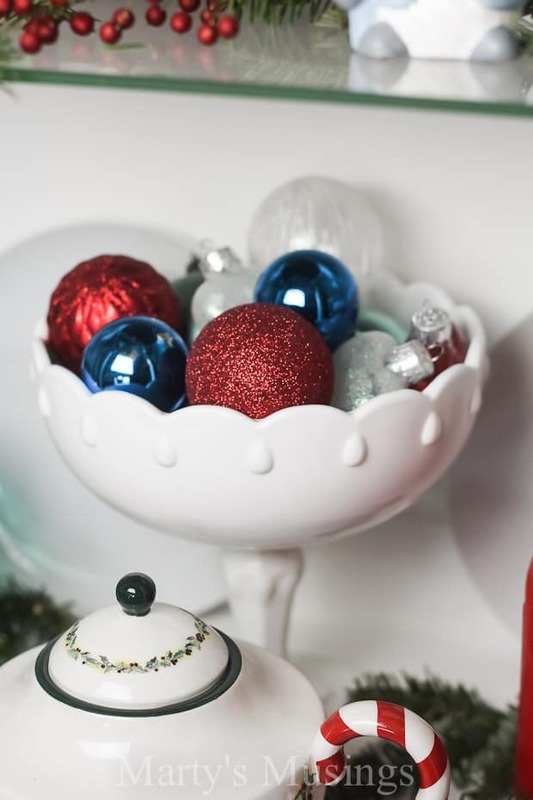 I love a little bling at Christmas, but I’m always on the lookout for everything from vintage ornaments to colors I might want to incorporate in a new scheme for coming years. Think outside the box and let your creative juices soar! Can you say free? Free is good! A touch of greenery and pinecones with these ornaments and burlap balls add simplicity to a beautiful tablescape. 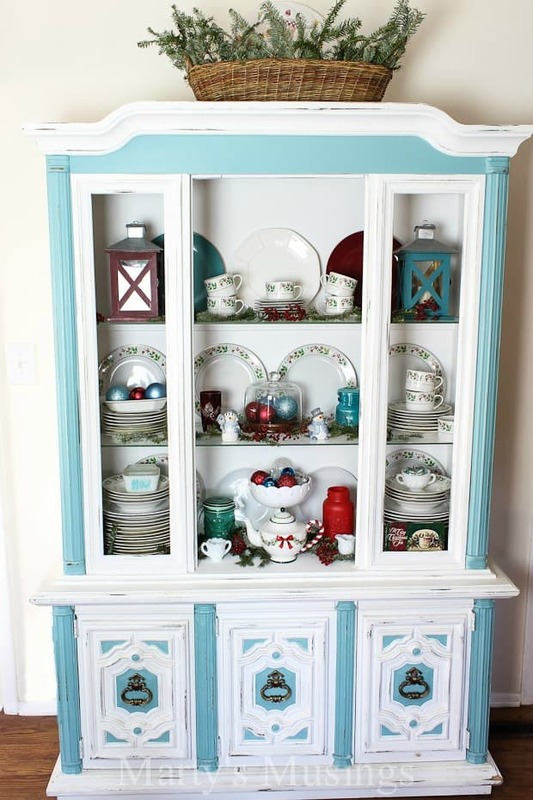 This chalk painted hutch is a bit more full than I have it now (I’m working on decluttering, y’all!) but I do love the greenery in my yardsale basket. Now this is what I’m talking about! Simple and easy! My best tip is to ask for extra tree limbs if you get a real tree each year. I use them throughout my home with red berries from our bushes. Beautiful and free, the words I love to hear! There’s just something peaceful about sparkling lights at Christmastime. 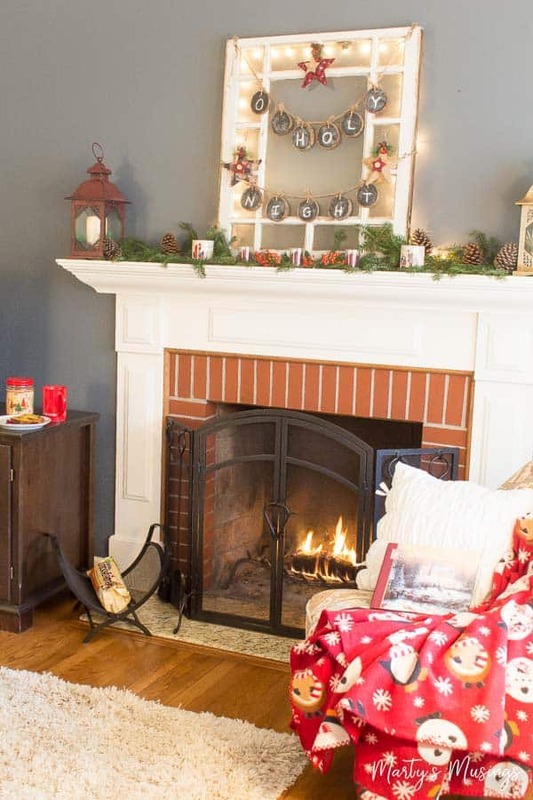 This was one of my favorite pretend mantels and was created from garland I bought at 90% off at the craft store at the end of the season. 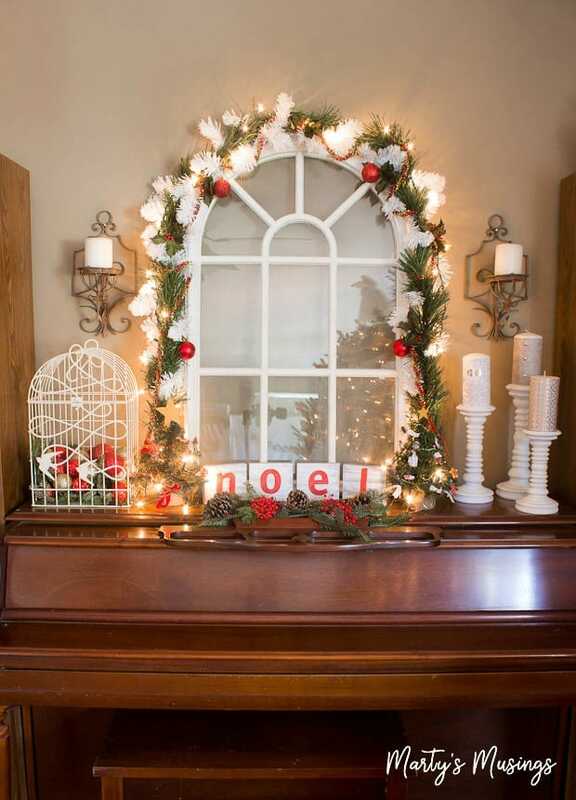 Add in a strand of lights, a few inexpensive ornaments and my $10 cathedral window makes a stunning focal point. 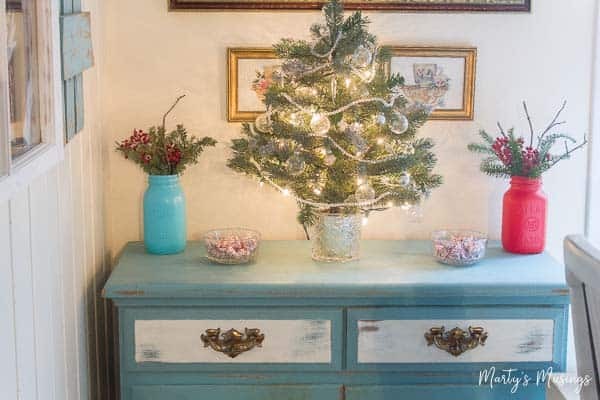 A hand-me-down Christmas tree with one strand of lights sets the tone on my chalk painted buffet. I love using candles in my tablescapes and vignettes, but most of the time I don’t even light them. I often buy beat up candles for pennies at yard sales and then wrap them in fabric or scrapbook paper, like these below, to dress them up. Aren’t they lovely? 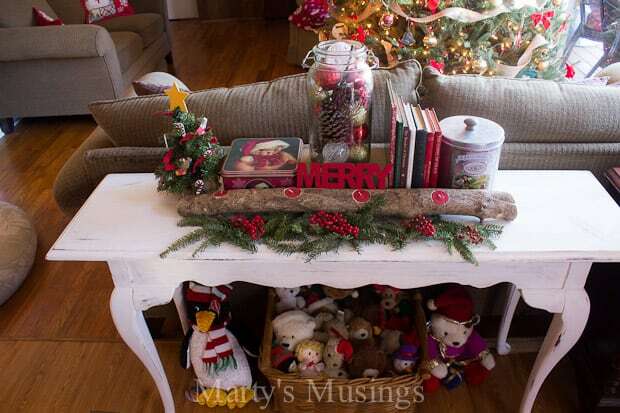 Look closely and you’ll see my branch candle centerpiece dressed up with red candles. 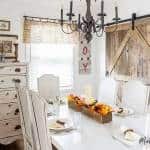 You may not be able DIY your own but you could use a simple piece of wood with votive candles to add your own rustic touch. 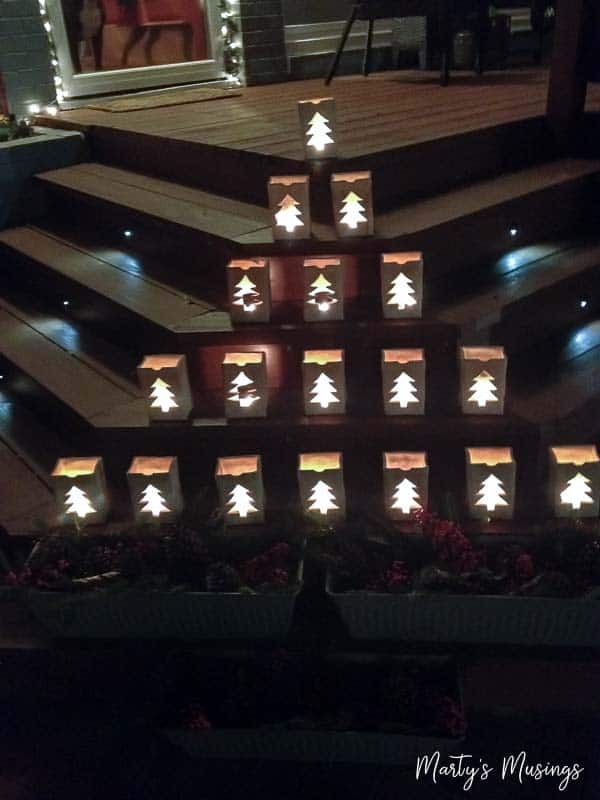 These luminaries are over two decades old but I pull them out every year for our enjoyment. When we built our front deck I realized they were perfect for the narrow steps we don’t really want people using. Plus, they’re the perfect way to greet visitors to my annual Christmas party! If you don’t want to buy ceramic ones like I have you can merely make your own with paper bags and sand. Say what? How in the world is spray paint a Christmas decoration? I’m always on the lookout for things to paint at yard sales, like mason jars or home decor accessories that need sprucing up. 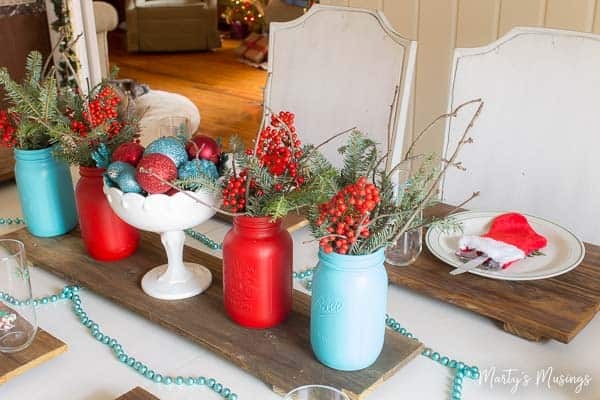 I love aqua and red in my kitchen and this Christmas tablescape is perfect with my ornaments, natural elements (see how I’m using all these cheap tips!) and painted mason jars. 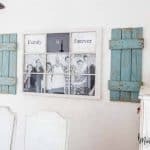 I also bought these shutters for $1 at a yard sale and spruced them up with chalk paint. Now it’s one place I change out seasonally, like with these $3 wreaths from the craft store. Whew! These are a lot of tips, but I hope you can pick a few to try this year and maybe some things to shop for in the months to come. 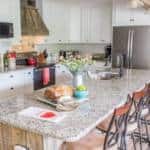 An authentic home you’ll treasure is right within your grasp! 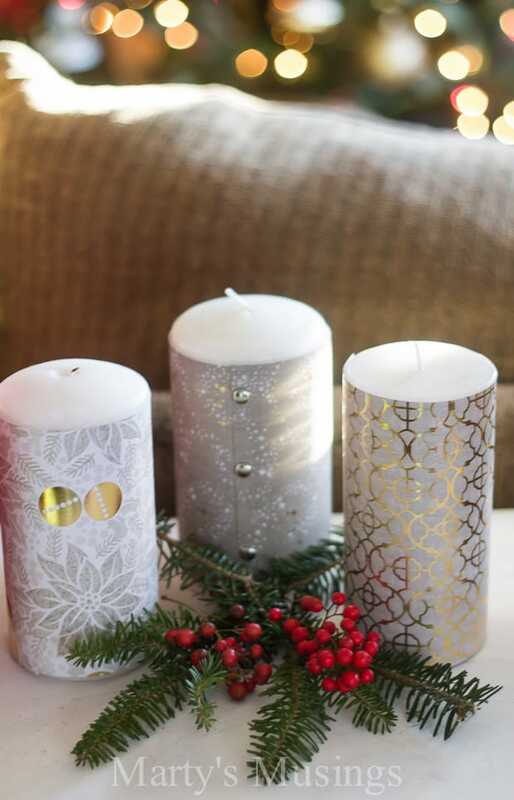 Which of these cheap Christmas decorations will you try first? If you were inspired or encouraged by this post I’d love if you’d share it or pin it and save it for later. Thanks so much! 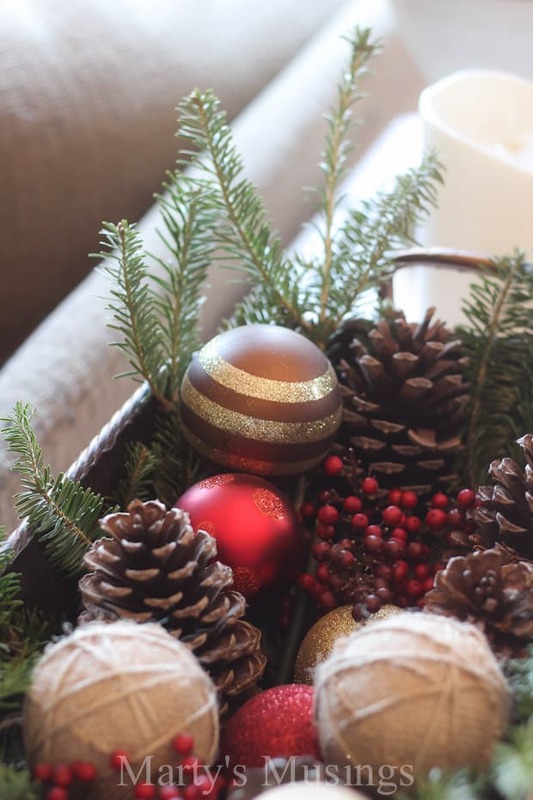 All of your reasonably priced, natural and “using what you have” tips are a good reminder that Christmas decorating can be simple, attractive and affordable. I was scrounging around in our basement storage room and found 4 sets of shutters my father-in-law gave to my husband a few years ago. I’m going to take a couple, paint them white, distress them a bit and hang weaths on the front of them like those pictured above. I have more plain green wreaths than I’ll ever need. I always pick a couple of them up (on sale/really cheap) because I forget whether I need more or not! I’ve never been big on a house filled to the top with Christmas decor. I like to still have the sense of home with just a bit of embellishment. 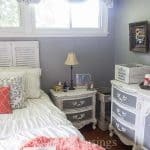 These shutters will be perfect. Hi, Judy. I’m so glad you’re going to use my shutter idea. 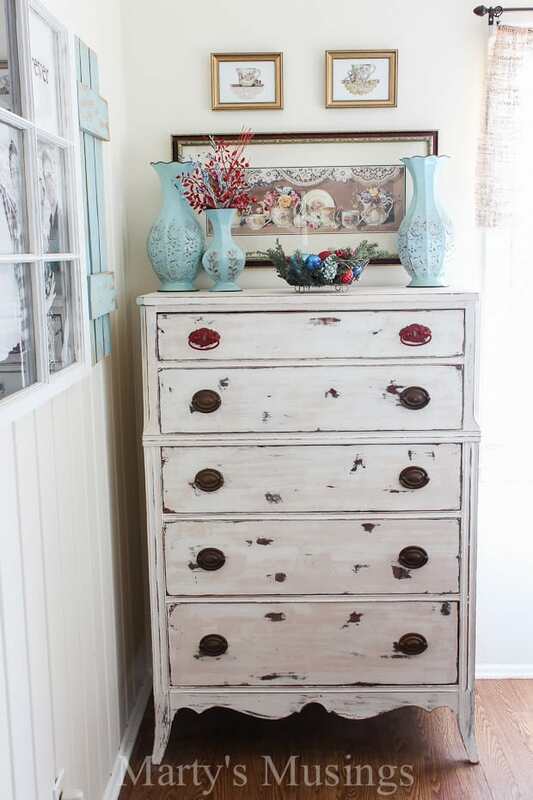 It’s such an easy way to decorate, especially when you have some laying around! I’m really working on decreasing the amount of stuff I have because I believe it will destress my life and help me live more simply and more focused on the important things! Merry Christmas! Wonderful ideas, Marty! 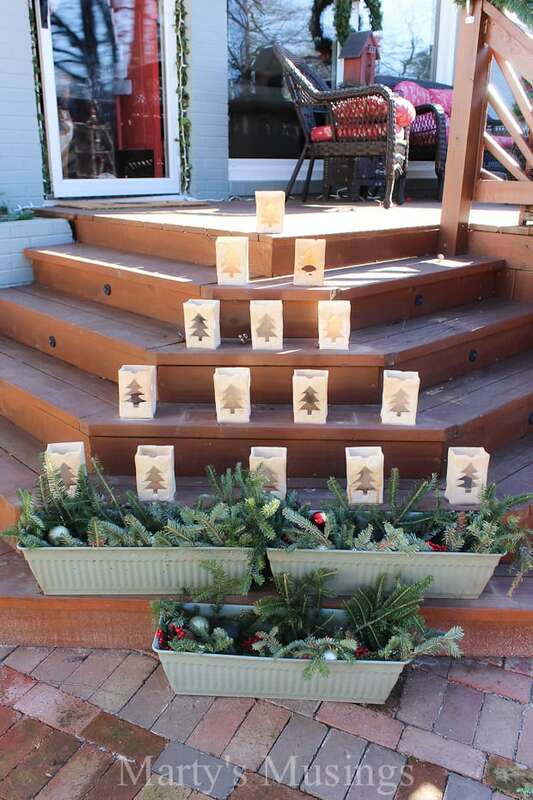 I wrap solar lights around an old upside down tomato cage for a fun “tree” decoration on our deck. I also wrapped burlap around a hula hoop and used a string of lights to make a star to hang in a tree. Hi, Candace! Love your ideas and I know your home is beautiful! Have a blessed Christmas! Brilliant Marty! I got too many ideas for this Christmas from your blog. Now everyone can make their Christmas decoration at a cheap cost. Thanks for the lovely blog. Hi, Diana. I’m glad you got a few Christmas ideas. It’s never too early to start!